If we assume initially that all options sets are convex-outwards, then we can see that relatively low CR habitats should favor a higher reproductive allocation, whilst relatively high CR habitats favor a lower reproductive allocation (Figure 4.26a). This pattern can be seen in three populations of the dandelion Taraxacum officinale. The populations were composed of a number of distinct clones that belonged to one or other of four biotypes (A-D). The habitats of the populations varied from a footpath (the habitat in which adult mortality was most indiscriminate - 'lowest CR') to an old, stable pasture (the habitat with most adult competition -'highest CR'); the third site was intermediate between the other two. In line with predictions, the biotype that predominated in the footpath site (A) made the greatest reproductive allocation (whichever site it was obtained from), whilst the biotype that predominated in the old pasture (D) made the lowest reproductive allocation (Figure 4.26b, c). Biotypes B and C were appropriately intermediate with respect both to their site occupancies and their reproductive allocations. Figure 4.27 Age and size at maturity in productive and unproductive environments. 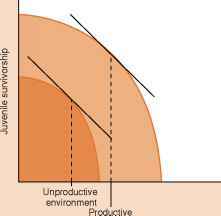 When reproductive value at maturity is traded off against juvenile survivorship, the trade-off curve at the edge of the options set in the productive environment lies beyond that in the unproductive environment, and earlier maturity at a larger size is predicted. are therefore relatively low CR, and, as predicted, the guppies there mature earlier and at a smaller size. They also make a larger reproductive allocation (left-hand columns in Table 4.6) (Reznick, 1982). Moreover, when 200 guppies were introduced from a Crenicichla to a Rivulus site, and lived there for 11 years (3060 generations), not only did the phenotypes in the field come to resemble those of other high CR (Rivulus) sites, but it was also clear that these differences had evolved and were heritable, since they were also discernable under laboratory conditions (right-hand columns in Table 4.5) (Reznick et al., 1990). Understanding age at maturity, however, requires us to move beyond our simple classification of habitats. For example, the favored age and size at maturity can be thought of as being governed by a trade-off between juvenile (pre-maturity) survival and reproductive value at maturity (for a review, see Stearns, 1992). Deferring maturity to a larger size increases the reproductive value at maturity, but it does so at the expense of decreased juvenile survival, since the juvenile phase is, by definition, extended when maturity is deferred. With this trade-off in mind, we can ask, for example, how age and size at maturity might differ between a 'productive' environment, with abundant food, and an 'unproductive' one in which individuals are poorly nourished. If increased food availability increases both the rate of growth (i.e. the size at a given age) and juvenile survival (i.e. the probability of reaching a given age), then the options set in the productive environment will extend beyond that in the unproductive environment, whatever the shape of the trade-off curve (Figure 4.27). 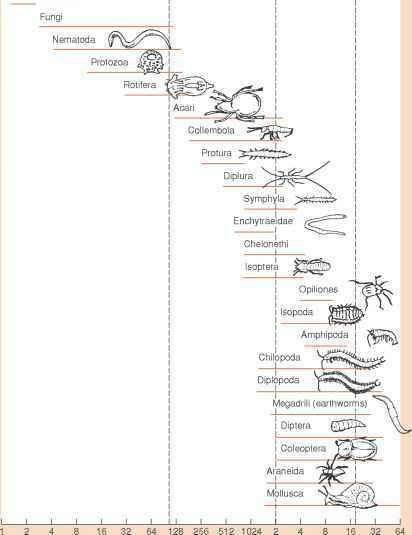 Organisms in more productive environments should then mature both earlier and at a larger size. This has been observed commonly in Drosophila melanogaster: flies growing at 27°C with abundant food at moderate densities start to reproduce at 11 days, weighing 1.0 mg, whereas crowded, poorly nourished flies start after 15 days or more, weighing 0.5 mg (Stearns, 1992). Note here that we are comparing the immediate responses of individuals to their environments, rather than comparing two quite independent populations or species. We return to this point in Section 4.13. Returning to a comparison of high and low CR habitats, it is clear that semelparity is most likely to evolve in the latter (Figure 4.28a). This is borne out in a detailed way by work on two species of Lobelia living on Mount Kenya (Figure 4.28b). These are long-lived herbaceous species: both take from 40 to 60 years even to mature, following which the semelparous L. telekii dies, whereas the iteroparous L. keniensis breeds only every 7-14 years. Young (1990) and Young and Augspurger (1991) showed that in drier Lobelia sites, probabilities of adult survival are smaller and periods between reproductive events are longer, i.e. the drier sites are lower CR. Semelparity would only actually be favored there, however, if semelparous plants also gained a sufficient reproductive advantage by diverting more resources to reproduction and less to future survival. In fact, there appears to be a close correspondence between the geographic boundary between the semelparous and the iteroparous species and the boundary where the balance of advantage swings from one to the other reproductive strategy (Figure 4.28b). If we now relax our assumption that all options sets are convex-outwards, it is apparent that semelparity is especially likely to evolve in organisms with options sets that are concave-outwards, i.e. where even a low level of present reproduction leads to a considerable drop in, say, future survival, but increases from low to moderate levels have little influence on survival (see Figure 4.24). This is the likely explanation for why many species of salmon display suicidal semelparity. Reproduction for them demands a dangerous and effortful upstream migration from the sea to their spawning grounds, but the risks and extra costs are associated with the 'act' of reproduction and are largely independent of the magnitude of the reproductive allocation. What is CRoffspring size sensitive?